An avocado a day keeps the doctor away. Okay, that statement may need some fact-checking, but I do eat a whole avocado most days — so I’ve made it my motto as well as my M.O. Adding avocado to a hot, melty quesadilla may seem strange, but let me assure you: it just works. For these Caramelized Onion, Spinach, and Avocado Quesadillas, you simply add the sliced avocado at the very end of the cooking process so it doesn’t get overly hot or mushy. Caramelized onions definitely take their fair share of time to cook, but they’re so worth it. They add rich, deep flavor to a meal, which makes you feel fancy — even though you secretly know they’re a cinch to make. The onions cook down quite a bit, so I use two for this recipe. 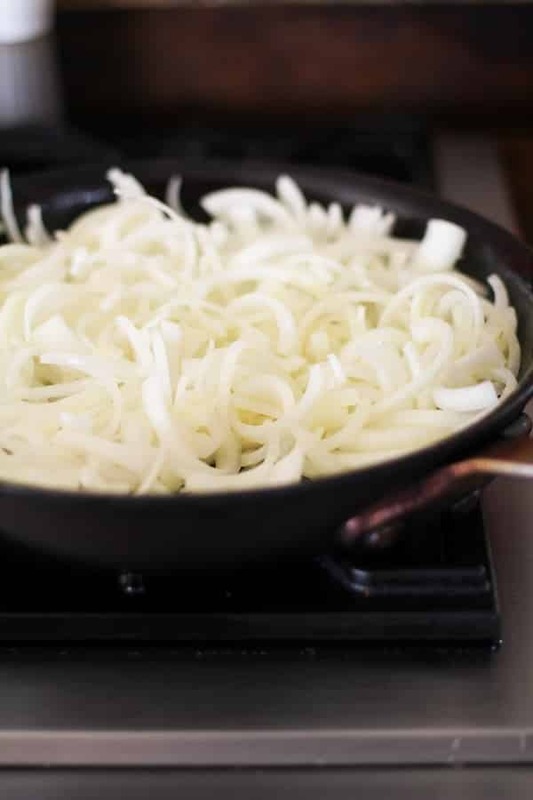 To caramelize them, start by adding 3 to 4 tablespoons of oil to a skillet, add the onions, and sauté over medium heat. The onions will sweat, then turn translucent, and then finally brown into caramelized goodness. The best thing about caramelized onions is that they freeze well! So you can make a big batch when you have time, keep ’em in the freezer, and use them whenever you need an emergency quesadilla. Those sweet caramelized onions paired with creamy avocado make a delicious quesadilla on their own, but we also invite spinach, because: vitamins. Since everything on the inside of this quesadilla is soft, I like to make the tortilla crispy to add contrast. I cook the quesadilla on medium-low heat for a few minutes so that the tortilla crisps up nicely, but doesn’t burn. Who would have thought all you need for a fancy, flavorful quesadilla is onion, spinach, and avocado? Enjoy this crispy/creamy quesadilla with your favorite salsa or cilantro pesto. 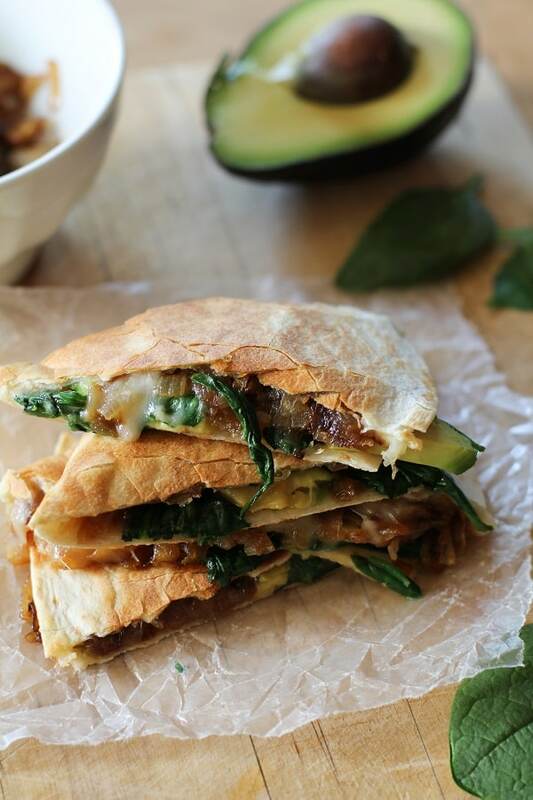 Creamy avocado, sweet caramelized onions, vitamin-packed spinach, and Jack cheese melt together in a crispy golden-brown tortilla. Add the oil to a large sauté pan over medium heat. Add the onions and salt and cook, stirring occasionally, until the onions are soft and deep golden brown, about 30 to 40 minutes. (If the sides of the onions begin cooking too fast, lower the heat to medium-low, add a little more oil, and stir. Your goal is to have the onion slices cook as uniformly as possible.) Remove the onions from the pan and place them in a bowl. In the same sauté pan over low heat, add the spinach and cook, stirring frequently, until wilted, about 2 minutes. Remove from heat and transfer the spinach to another bowl, then carefully wipe the pan dry with a paper towel. Return the pan to the stove and increase the heat to medium-low. Lay one tortilla flat in the pan. Evenly sprinkle 1/2 cup of cheese over the top. To the bottom half of the tortilla, add 1/4 of the caramelized onions, followed by 1/4 of the wilted spinach. Heat until the cheese melts and the tortilla is browned and crispy. Add the avocado slices (about 1/2 of an avocado per quesadilla), and immediately fold the tortilla in half, onto itself, and flip it over. Continue cooking for about 30 seconds or until warmed through. Using a spatula, transfer the quesadilla to a cutting board. Cut into fourths. Repeat this process with the remaining ingredients and serve with your favorite salsa or cilantro pesto. Love the addition of spinach, and that you made the whole thing crispy! Who wants a mushy quesadilla? Glad you love the idea of spare caramelized onions as much as we do! They really are amazing for injecting lots of flavor into a meal. Hope you enjoy the quesadilla! Caramelized onions are one of my favorite things, so I will definitely make this! I never knew you could make them ahead of time and freeze them. How do you recommend reheating them? Just throw the frozen onions in the skillet for a bit? So glad to hear you’re excited about the quesadilla! You’re spot on when it comes to re-heating caramelized onions. Simply put them in a skillet or small saucepan and heat them up on the stove. This is my preferred re-heating method over microwaving any day 🙂 Have a great week! My favourite way to eat quesadillas! Recently made caramalised onion and beans quesadilla. Your version sounds so yummy! Wahoo! So glad you’re into putting caramelized onions in your quesadillas as well! Beans would be excellent, thanks for a wonderful idea! Oh wow this looks incredible!!!!! Let’s hear it for eating an avocado a day! I drizzle a little balsamic, salt, and pepper into mine and scoop it from the peel. YUM! I make quesadillas for my family once a week. Because I’m a vegan, and not a fan of vegan cheese (too processed), I make my own refried beans and use them for the “glue” to hold the ingredients together. They also create the creamy texture that cheese does. These look so good that I think I know what’s for dinner tonight. Quesadillas always look so good to me but I rarely make them at home. Pinning this one so I can try it. It looks delish! Same here, Brittany – I tend to reserve quesadillas as an every-once-in-a-while thing, too. Let us know when you try it out! Love me a fancy quesadilla, and this one sure isn’t hum drum…na uuh! Haha! Yup, it’s a pretty funky fresh one. Glad you like it, Kari! I am totally an avocado a day type of girl 🙂 No fact checking needed, they are healthy. This quesadilla is right up my ally, so I’m pinning it onto my avocado board. Can’t wait to make it! I borrowed this avocado infographic from Mercola.com. It is pretty cool! Wow, that’s a really cool infographic!! I had no idea you could use avocado as sunscreen. The avos at my store have been rock solid lately, so you best believe I’ll be sticking them next to my bananas until they ripen, ha! I think folks are starting to embrace the fact that your body needs fat in order to absorb nutrients. I remember my friend’s parents being crazy over fat-free milk and now it seems like more households are embracing the fact that healthy fats should be embraced. I completely agree! People are starting to get off the low-fat bandwagon. More and more research has been coming out about ditching the old idea of low fat, and instead embracing the fat and limiting sugar. Caramelized onions are worth every minute of effort. This may sound weird, but I could eat a bowl of thos sweet, sweet onions. This quesadilla looks amazing. Confession: I had some leftover caramelized onions when I made this recipe, so they totally went into a bowl…and then into my mouth. Caramelized onions for breakfast? Don’t mind if I do! I can’t think of a more delicious-sounding quesadilla right now. Honestly, this sounds like such a tasty lunch (or dinner – or breakfast? Well, why not!) Great tip to freeze caramelized onions … I would never have thought of doing that. Thanks, Helen! It really is an all-star meal! I wouldn’t be opposed to eating it for breakfast at all. I’d maybe even put a fried egg on top. mmmm!! Caramelized onions and avocado? Yes please! This looks amazing! Glad you like it Meredith! It’s amazing how buttery and delicious caramelized onions and avocados are together. Seriously a flavor-blasted incredible combination!! Oh my goodness – that looks *so* incredibly decadent and lovely! 😀 I’ve never made caramelized onions before, but I figure a splash of olive oil will do me good. Just need to make some cheese and this is 100% happening over the weekend! Oh yes, you will become addicted to whipping up caramelized onions! They make everything taste soooo goooood! I’m impressed you make your own cheese! – a quesadilla with homemade cheese? Now that’s decadent!! Wahooo! I’m so impressed that your daughter is adventurous enough to eat grown up quesadillas! My nieces and nephews are so boring with their food. They pretty much won’t touch anything that’s not the color of cheese, ha! 🙂 Let us know how your daughter likes it! stop!!!! This looks too good!!!! Haha! Thanks, Rachel. It really is a delicious meal. My avocado allergy is making me really upset right now. But caramelized onions…they might just make up for it. What a quesadilla! Yup I definitely consume an avocado a day, no doubt. These quesadillas look fab! This was absolutely delicious! I served this with the cilantro pesto and a little homemade salsa fresca. Looking forward to making this again. Thanks for the great recipe! Awesome, Zoe! I’m so glad you tried and loved the quesadillas. I bet the cilantro pesto and salsa we amazing additions to the meal! All sorts of flavors! Thanks for the feedback, my dear. As a college student living on my own (more importantly cooking for myself!) for the first time, I am always on the lookout for easy, healthy, and affordable meals. These were AMAZING. I halfed the recipe for myself and my roommate, and I was so happy with the results. I literally had never sliced an onion by myself up until tonight (not ashamed to say I looked up a how-to on youtube!). These were so easy and absolutely delicious. We added some chicken that we had left over as well. I am definitely adding this recipe to my list of recipes I love! Thanks! I made this for dinner last night and it was soooo good – so much so I am having it again for dinner tonight! This looks and sound delicious. I definitely want to try this this weekend and it’s great that I can make and freeze the caramelised onions ahead of time. Made this deliciousness for lunch today and it was as I said delicious ^_^. Made some mango salsa to go with it and all was good. I made this for dinner last night, and it was amazing! My husband and I both really enjoyed it. The flavors worked very well together. I will definitely make this again!! I made this for a late Saturday breakfast today and it was so so good! I am guilty of not reading the recipe in full before starting, but serendipitously decided to make pico de gallo while my onions were caramelizing. The quesadilla itself was crazy tasty – something I would absolutely order out at a bistro. Having a bright, acidic pico on top brought it to another level. So so good and something I will make often. Thanks for posting! Made this last night and it was AMAZING! And I forgot the salt! Even though we eat meat, we all felt that this dish was very filling, and that you don’t miss the meat at all. Thanks for creating this dish!